He had been so impressed so far by what we had seen today; Nara National Museum, some small shrines and the deer roaming freely around the temple complex. He was always pointing out new things he saw and I don’t know how many packets of deer biscuits he bought to feed the deer. I could not wait to see how he would react to what was housed inside Daibutsu-den. My first time in Japan was with another friend, we were both equally impressed by the country, always being surprised and experiencing it together. My second time was alone. I was still impressed by what I encountered, but I got more and more used to things in Japan. Some things became normal, other things still surprised me. I did not have anyone to share my experience with either. Now, on my third visit, I travelled five days with a friend who had never been to the country before. I was his guide and I loved it. I loved watching him react to all the strange things you encounter in Japan. I loved when he first entered the bathroom in our hotel room and yelled to me about the toilet. I have gotten used to the fancy toilets in Japan, where you can rinse your bum and have a heated toilet ring. He had never seen one before. I loved watching his reaction to the level of service offered in Japan and how Japanese sometimes fall asleep in bars and nobody cares. I loved seeing him impressed by the train system and trying to get used to no tipping. 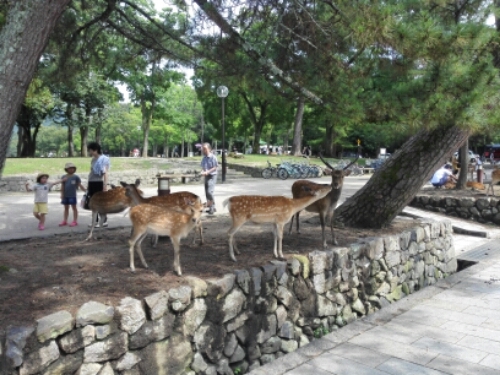 Even though I had already been to Nara I had no problem going there again. This time I could experience it through my friend. Nara really takes you back to old Japan. 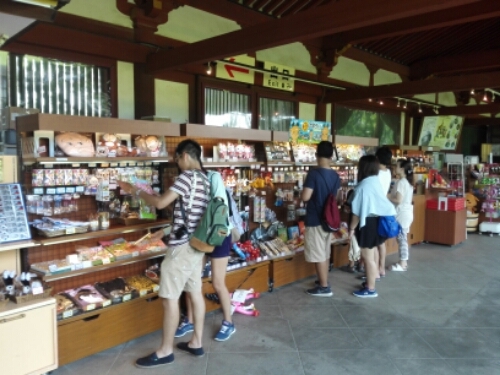 Yes, it is overrun with tourists, and the quality of the food I have eaten there haven’t been the best I’ve experienced in Japan (except Japanese breakfast at a ryokan), but the amount of incredible temples and shrines there is impressive. In a day you could fill your quota of temples to see while travelling. And the temples are all so beautiful, so impressive, so Japanese. It is well worth a visit. 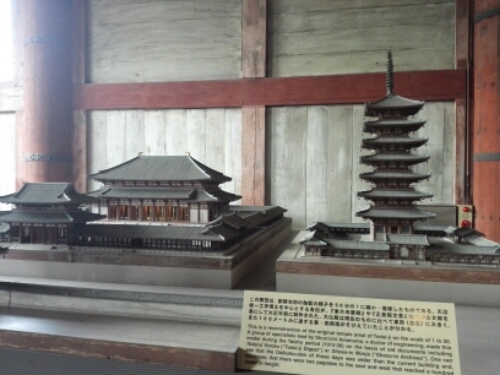 At Nara National Museum several small artifacts were on display, my friend loved them. He was especially impressed by the small buddha statues and carvings. I knew I had to take him straight to Todai-ji. How would he react to the Daibutsu? 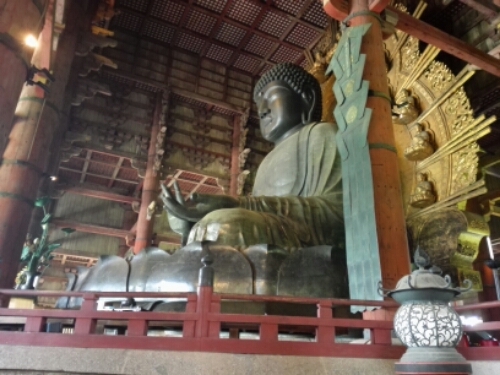 As we entered Daibutsu-Den (Great Buddha Hall) I was looking at him, saw him gaze up, stop, take it all in. Then take it all in again. 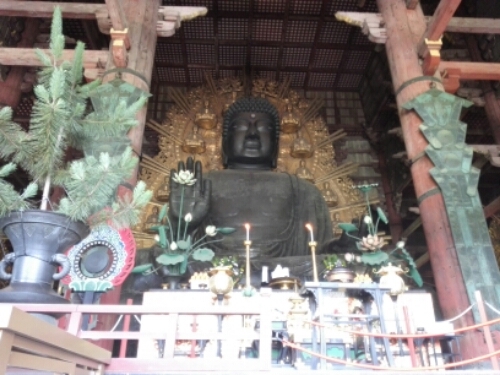 The Daibutsu, or great Buddha, is impressive. A full 15 meters tall, in bronze and copper, it is the second largest buddha in the world. It towers over you as you stand beneath it. Makes you feel small. It is quite a sight. 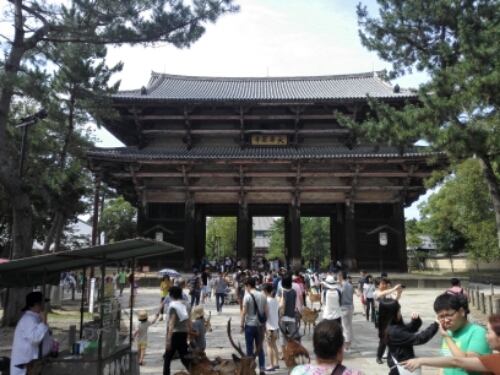 The construction of the Daibutsu started in 749 by Emperor Shomu after a smallpox epidemic had broken out in Nara. The Daibutsu was built to please the gods. 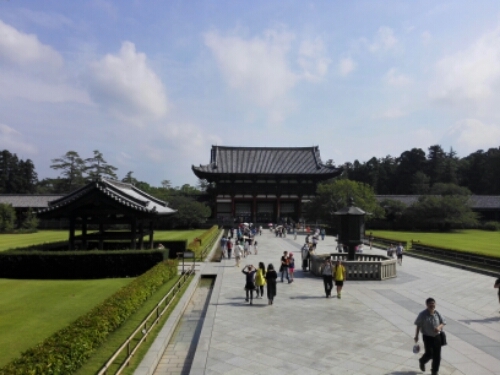 Completed in 751, housed in Daibatsu-Den which was constructed at the same time, it was dedicated in 752 in a huge ceremony with official guests coming all the way from China and India. The Daibutsu of today is only partially the original one. Over the years the Daibutsu and Daibutsu-Den have had to withstand earthquakes, fire and attacks. In 855 the head fell of during an earthquake, and in 1567 the Daibutsu-Den burned down during an attack on Todai-Ji. It wasn’t rebuilt for over 100 years. The Daibutsu was left out in the elements during that period. Today only the base of the Daibutsu is from the 8th century while the head is a more recent addition. 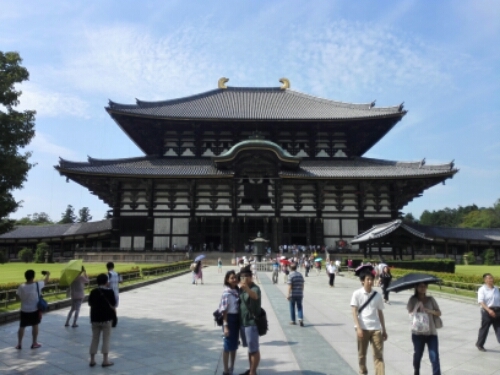 The Daibutsu is an impressive sight, it is hard to explain the size of it, it must be seen. My friend just stood there for a few seconds, taking it all in. I could see he was impressed. He turned towards me with a huge smile on his face. ‘Wow, this is amazing!’ He said. The rest of the day he seemed to be in a state of perpetual bliss. I felt my work as a guide was well done. You love Japan , so what could be better than to have you as a guide.